It’s hard to believe just how far we’ve come in 100 years. 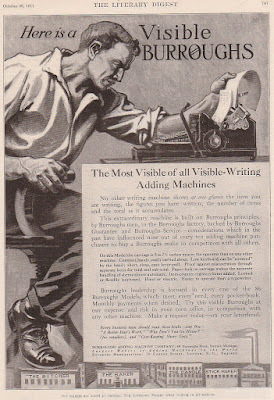 In this ad from 1911, we see the description of a state-of-the-art device that did nothing but simple addition and subtraction. These all-mechanical beasts were the Excel spreadsheets of their day. “No other writing machine shows at a glance the item you are writing, the figures you have written and the total as it accumulates” the text brags. Note too the lever which must be pulled after each entry. What is more interesting is the image given by the man operating it. This burly type is more suited for the forest than the office. Perhaps he’s the minimum physical specimen required to move this “compact, handy, and easily carried about” device from room to room. PS: To those of you who may be wondering, I have the original ads for this and all of my other postings available for sale or trade. They make great framed art gifts. Drop me a line if you’re interested.